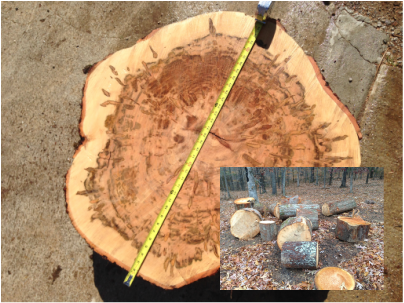 Typically some soft ample, poplar, hard maple, sassafras, and cedar. have lots of folks ask us for wood tuning blanks, and we used to specifically saw them, but everyone wants different sizes and I hated wasting the valuable log ends. So now I sell the fresh cutoffs themselves, so folks can section them up the way they want, at home.